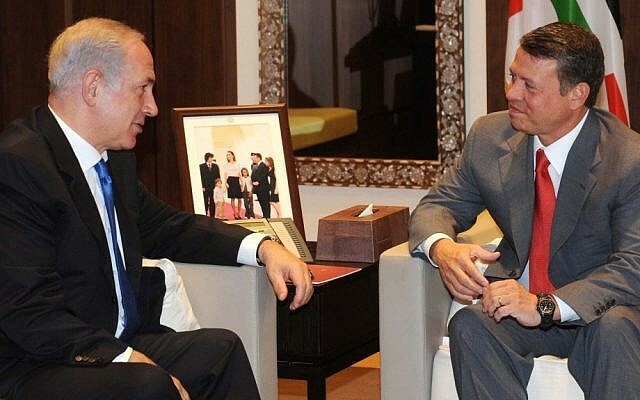 JERUSALEM: Israeli Prime Minister Benjamin Netanyahu met with Jordan’s King Abdullah in Amman on Monday to discuss ways to advance regional peace, Netanyahu’s office said in a statement. The two leaders “discussed regional developments and advancing the peace process and bilateral relations,” the statement said. Jordan made peace with Israel in 1994. It is one of two Arab countries, along with Egypt, to have treaties with Israel and both countries have been involved in efforts to reach a peace deal between Israel and the Palestinians. U.S. President Donald Trump’s administration has been working on a long-awaited Israeli-Palestinian peace plan, but it has yet to be made public. White House senior adviser Jared Kushner, the U.S. envoy to the Middle East and Trump’s son-in-law, and Jason Greenblatt, Trump’s Middle East peace negotiator, are expected in the region this week to discuss their peace plan. Abdullah’s Hashemite dynasty is also custodian of the Muslim holy sites in Jerusalem. “Prime Minister Netanyahu reiterated Israel’s commitment to maintaining the status quo at the holy sites in Jerusalem,” the statement said. The last round of U.S.-led peace talks collapsed in 2014.